Arlington Cemetery exhibit dedicated to death and grieving. Sorry, Museum of Mourning Art is permanently closed. Update: The Museum of morning art is currently closed, while it auctions off some of the collection. This eccentric mansion museum holds a impressive collection of rare and automatic instruments. Once used to screen films for theater owners to rent, this historic building is now a start up hub. Mourning and personal response to death are unique to every person. But the Museum of Mourning Art at Arlington Cemetery categorizes the motifs that are present throughout American art dealing with death and loss. Although it is sponsored by Arlington Cemetery, the Museum is actually modeled after Mount Vernon, George Washington’s famous home. This was done specifically because George Washington’s death influenced the representation of death in art. Following his death in 1799, American art began to reflect the collective loss of the revolutionary leader. Besides art displaying the motifs of angels, wreaths and lambs, the museum also holds some artifacts related to mourning, including funerary outfits and horse-drawn hearses. One of the most unique artifacts in the museum is the cemetery gun, which was created to prevent intruders in graveyards. The gun was rigged to fire if intruders set foot in the cemetery when they were not allowed. This old-school and extremely deadly security system was abandoned due to its barbarism, and the museum holds one of the few remaining cemetery guns in the world. 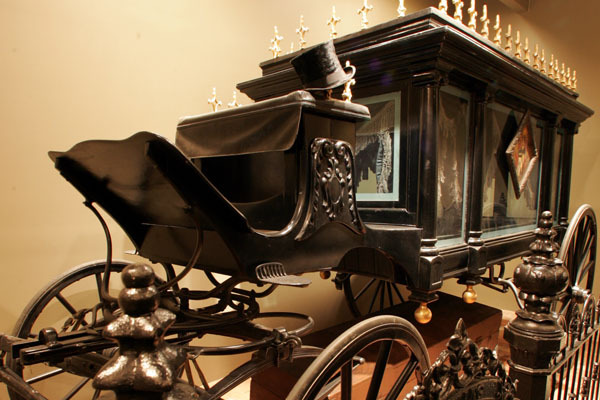 This Funeral Hearse Museum represents the finest in cadaver transportation. This German museum is devoted to all aspects of grave culture from headstones to coffins.